The two photographs included in the International Photography Annual are from the Natural Structures series, which is largely focused on the Kingdom Fungi. These beautiful structures seem to just pop up, are usually ignored, and then shrivel, or turn into jelly. But they are immensely varied, quite beautiful, and an integral part of the ecosystem. All of the fungi, lichen, and Indian pipes in this photographic series were taken in my yard in Tennessee, no travel required. I just had to look, every morning and every evening. I kept a mental inventory of what was breaking the surface and what was decaying in an interesting manner. Then I would gather my camera, lenses, tripod, various attachments, and some old clothes for crawling around in the dirt and mulch. If a day's shooting yielded one or two good shots, I felt lucky. As far as fungi, I am fortunate, in that I have one maple, two old beech trees, several hemlocks and numerous rhododendrons in close proximity to one another, and they provide the ecosystem that encouraged these beautiful structures to grow. I began taking photographs as a college sophomore with an old 1963 Pentax H3 SLR camera and a 50mm lens. Within a year I had saved enough to upgrade to a new 1977 Pentax Spotmatic F. Back then everything was manual and film-based. I usually shot Kodachrome color slides, but eventually set up a black and white darkroom. Time passed and my interest in photography temporarily waned, except as a means of photographing my artwork. For this I moved to a Nikon FM2n, still all manual and film. I resisted the change to digital until 2006, at which time I purchased a Nikon D80 digital SLR and then kicked myself for not switching to digital earlier. I usually used a 60mm Micro Nikkor lens, and eventually upgraded to a Nikon D90 digital SLR. I now use a Nikon D7000 digital SLR, which ironically accepts the older manual focus Nikon lenses and allows through-the-lens light metering with these older but optically wonderful lenses. The lenses I rely on now are all in the Nikon micro line, a 60mm AFD, 60mm AFS, 105mm AIS (manual focus), and 70-180mm AFD Micro Nikkor zoom lens. I also use a Nikon PB6 bellows unit with the 60mm AFD lens for greater magnification. I like the technical side of photography, both in initial capture and in processing and printing, but what I have truly enjoyed is the challenge of macrophotography. I think this type of work is both technically demanding and requires constant attention to design basics of line, shape, value, and texture. Removing color, by processing in black and white, stresses the importance of these basic elements even more. 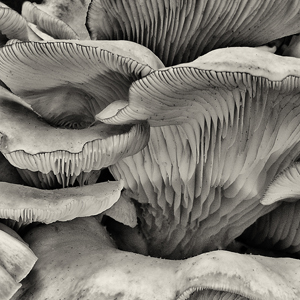 Subject matter that initially seems unappealing can prove to be fascinating on a macro level--a shriveled mushroom becomes an abstract composition. Alternatively, it is a blurred mess. That is the challenge of macro work. North American Juried Print Biennial, 808 Gallery, Boston, 2013, Danforth Museum, Framingham, Massachusetts, 2011; 808 Gallery, Boston, 2003, 2001.